Click HERE for first lesson. Today i will tell about Direct3D basics and introducting to D3D. Now i'll tell you, how to make initilization of Direct3D and Direct3D device. Note: You must install DirectX SDK 2010, as i said in first lesson. Lets do something in it now! As you see, this line of code is loading d3d header and data. Also, we need to add library file. Now we must setup global variables for d3d device and initilization. Lets set some functions now. Okay, now we need to setup and initialize Direct3D stuff. We'll use R_Init method now. Let me explain you some stuff that you will need. The following lines of code are parameters for d3d device. You can set height and weight there too. As you can see, there are new parameter, now you can toggle fullscreen. The following lines, "merges" Direct3D stuff to our window. Now you need to load this method. Put this in WinMain method after ShowWindow method. If you will put this before ShowWindow, program will crash or just now show. Now we need to setup renderer. We will use R_Frame method. I will explain now, again, what do we need. 'Clear' clears current window to any color before rendering. Now we need to enable rendering. As you remember ( maybe not, lol ), we created realtime loop. Put R_Frame(); in end of looping. Well, there's last function, CleanD3D. It uses to destroy Direct3D stuff. Uses on program quitting. If you will launch it now, it will just crash. We need to clear memory of D3D Presenation Parameters, since PP doesn't have release method and couldn't be destroyed. We will use ZeroMemory method. 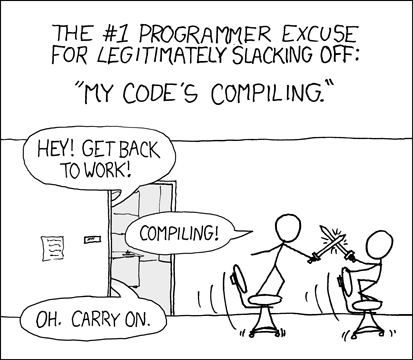 Compile it, Run it, and .. Ta-Da! You will see blue window now! You created your game world! Lets make some parameters now ( color of window, etc ). Lets change window clearing color now. You can see, in R_Frame method, Clear function. I think you have noticed, that, theres D3DCOLOR_XRGB. It is RGB gamma. Lets change colors now! Also you can use D3DCOLOR_RGBA ( alpha included, but it is useless ). Lets create variables for it. As you noticed, color data is bytes. But you can use integer also. Now, we can setup window mode toggling. It is Boolean type. And you can set it in WinMain or R_Init method. Well, i've created R_Prepare method to prepare all stuffs. ( I've moved all window stuff to it also ). Add this into header, or just in cpp file. End of tutorial, in next tutorial i'll tell about text/vertex creating.